I hope you are all having a beautiful weekend. Here it is one of the warmest times of the year at the moment. We are supposed to see 40°C and it might be a record. Since I am working in an air conditioned office (due to change soon), I didn't recognize how bad it is during the day. Now that I am home, oh well... But... we will be driving to Strasbourg France today, so that I can stock on Bioderma, check out Sephora. That is now a proper celebration of the new job by having dinner in one of out favorite restaurants in Strasbourg. I post about it at Instagram tonight. I thought since today will be a day in France, why not go with something French which I enjoyed during the last days when it became really hot here. 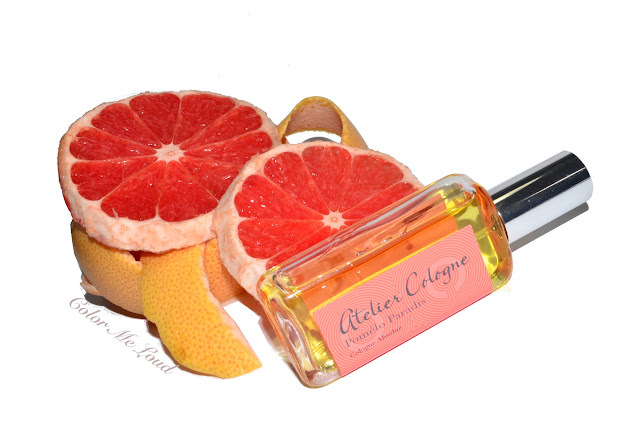 Atelier Cologne is known with their unique citrus creations. I have one of them for you today, Pomélo Paradis Cologne Absolue. Get ready for abundance of photos now because this bottle got me inspired. I just cut a pink grapefruit, which is the top note of this fragrance and gives it its name. I wished there would be a way to make you smell the air when I was taking the photos. The juicy grapefruit I cut smelled so divine and exactly like its counterpart in perfume. I sprayed Atelier Cologne Pomelo Paradis Cologne Absolue on my wrist to get in the mood, both blended into each other so well. I almost forgot how hot it was under the spot lights. Atelier Cologne bottles come in 30ml (pictured here), 100 ml and 200 ml. 30 ml bottles can be placed in a leather sleeve. On one side Atelier Cologne is engraved. On the other side they can engrave your name, if you buy online. Also some of the boutiques offer this service. I have noticed that Galeries Lafayette Strasbourg have it. I am planning to check the counter today. My bottle has my blog name on it with silver letters and the leather color matches the fragrance. Atelier Cologne online website also offers post card samples. I found the idea very creative. These come in half transparent white envelopes in 2 ml samples and there is a post card next to it which is unique to this fragrance. I like this idea much more than the classical samples because you can make us of these cards and not toss them away as I usually do with other sample boxes. They also get you in the mood and make your tiny sample very fun. Now on to the fragrance, shall we? It opens with a kick of most beautiful pink pomelo. It is very close to what I get when I cut one and take a deep breath. The opening is close but is a little sweeter thanks to blackcurrant. It is so fresh and uplifting. The citrusy notes stay as the hart reveals to be a little more floral and fresh due to mint. Rose is not very prominent, it is more of an impression. It dries down to a very light amber which stays close to skin. Vetiver is very well blended, thus no harsh presence. The citrusy notes are always volatile, so don't expect the super juicy yummy opening to stay very long but one wouldn't wish other wise when it is so hot out there. I am taking this one to holiday with me and will be spraying for a night out on the coast. It will smell divine combined with a salty breeze from the sea. Final thoughts: Juicy, yummy, light, smells so good. It is a short lived beauty before it becomes very close to skin, which makes it a great fragrance for summer. I recommend it if you are searching for something to lift your spirit during hot days when everything else becomes so heavy. What is you favorite summer fragrance? Have you tried Atelier Cologne? Sounds great! I love Aqua di, l'eau par Kenzo, Le Jardin (Hermes, all of them), tea line by Bvlgari. I also love peach Walter by Y. Rocher ans Caudalie scents. Oh, I adore citrus fragrances! The Atelier blood orange one is wonderful, too. And you're right that these scents just belong to summer! And now I miss the ocean terribly. Almost a physical ache. Aaaaagh, living in a landlocked city breaks my heart. I tried this and thought it really smelled like a real fruit! It launched near to Chinese New Year and was so apt with all the mandarin oranges we were eating and gifting. But it's too sweet to wear on the skin for me...So much fun though!! I am curious about Biotherm Ocean, have to check that out. It is an aquatic fragrance right? 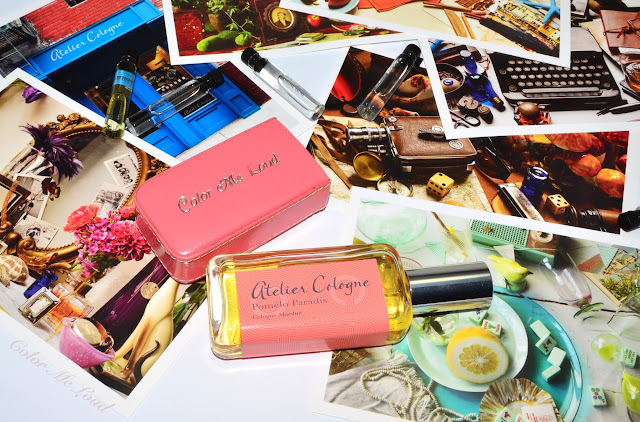 Atelier Cologne makes the most unique citrusses. Orange Sanguine is beautiful, Pomelo Paradis is a little sweeter than that one, depends on what you like. Hi, yes it is a lovely fragrance. Have to check Le Jardins. I have L'eau Par Kenzo but somehow I got tired of their repetitiveness along the way at some point. Armani Aqua di brought out a new version which I would like to test soon once I can make it to the counter. These days there is much to do at work. Hope you are doing great! these are summer in bottle, reminds me of all the oranges hanging on trees on Mediterranean coast. I want to go to ocean too, exactly that, feel trapped, need the salty breeze and the calming scene of blue. you are right, it smells like the fruit. When I cut the grapefruit for the photo shots, I was mesmerized by how close they are. It is interesting to hear, I didn't know that Chinese New Year is all about these fruits! Christmas also has orange and ginger lol. I can't wear sweet fragrance but adore this one. It is sweet but not overly so, not in a syrupy way, if you know what I mean. I meant the original l'eau par Kenzo, I stopped following the 'updates'. Good luck at work. I love grapefruit fragrances for Summer. I wore Jo Malone's for a while but now it smells a bit too sharp for me. I am testing Hermes Pamplemouse Rose at the moment and like it very much (it is very green almost grassy on me rather than rose) except it is not long lasting. I haven't tracked down Atelier in store yet but this sounds promising. I love love loooove this one! It's so delicous and in no way like a cleaner! If you like Pomela, like eating it, then you will love this. You can maybe order the postcard samples and check them out. I believe I have the original, have to wear it again. Maybe summer fragrances are not meant to be long lasting anyway, then they are a bit too heavy. This one is also not very lasting compared to say woody fragrances or white florals but for a citrusy one, it is decent. I am thinking of buying Atelier Cologne Ardent after my visit in Sephora. It is an unique fragrance !